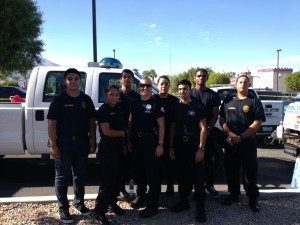 The Cathedral City Police Explorer Program is designed to assist young adults through training, education and preparing them for a career in law enforcement. The Police Department has strict policies in place to develop responsibility and professionalism while also instilling strong morals and ethics in our young adults that carry over to many careers other than law enforcement. Candidates who wish to become Explorers must successfully complete and pass the testing and background process to become Explorers. Explorers assist Police Officers and Police Personnel in a variety of assignments such as Patrol, DUI Check Points, Dispatch, Records as well as attending the Explorers Conference Competition in Las Vegas, Training Academy in San Diego, and the Central Coast Law Enforcement Explorers Competition in Paso Robles. 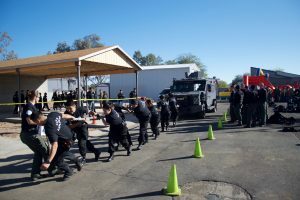 During the one week training academy in San Diego they are educated on laws, arrest and control, physical fitness and training scenarios. 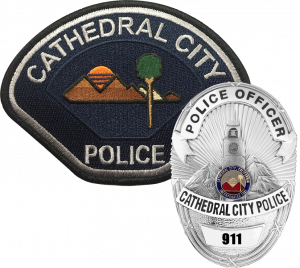 The Explorer Post also has weekly meetings which are held every Thursday at 6:30pm at The Cathedral City Police Department. Candidates must be able to attend the special details and functions as mandated by the Explorer Post Advisors.